Which Stamp Set is your Fav? We're here... at the Close To My Heart Convention!!! Want to win a Cricut Collection?! It's GIVEAWAY Time!! New CTMH Consultant Kits Available NOW!!! FREE CRICUT COLLECTION ENDS TODAY! Who is ready to be RAK'd? It's GIVEAWAY time... Who is ready to WIN?! Join My Team as a Close To My Heart Independent Consultant in April and get TONS of products for just $99. Check out the details..
CTMH January Special- Don't Miss It!!! Find out who the lucky winner of my August Giveaway is... Is it you? Let's Celebrate National Stamping Month Early!!! Check out pics and announcements from the CTMH Convention in Dallas, TX.. It's My Birthday Month and I've got GIFTS for you! It's a SPECIAL OFFER you don't want to miss! Don't miss the FREE goodies you can get this month! Shop my new CTMH site March 15th-17th and get a FREE A-Sized Stamp Set! Get a FREE Art Philosophy Cricut Collection when you Join My Team as a Close To My Heart Consultant in MARCH!!! Join My Team in March and get the Art Philosophy Cricut Collection for FREE... details here! Check out my Valentine's Day Special Offer... Don't miss it! CTMH Retiring Products - Get Them Before They're GONE!!! Close To My Heart Halloween Stamp Set GIVEAWAY!!! Need a Close To My Heart Idea Book... order today! Close To My Heart Products - On SALE Now! $2, $4, $6 for 8 It's YOU we appreciate. Close To My Heart Paper Sale Starts today 8/4! $2, $4, $6, for 8 days ...It’s YOU CTMH Appreciates! Here is a sneak peek of the Cherry-O set from the upcoming 2010 CTMH Summer Idea Book releasing in May. LOVE IT!!! Become a Close To My Heart Independent Consultant for ONLY $99 and receive the NEW Summer Kit (retail value over $300). Join My Team as a Close To My Heart Consultant in March and receive ALL the Stamp of the Month's from the upcoming Summer 2010 Idea Book. HUGE OFFER!!!! Wanna know what I've been up to??? Lets just say filming, editing and going to be offering some fab blog candy! Act quickly... visit www.Mandy.MyCTMH.com to take advantage of the discounted pricing from CTMH Holiday Heyday. Interested in Becoming a Close To My Heart Consultant ??? Have you ever thought of becoming a CTMH Consultant? Only $99 gets you started! The consultant kit is valued at $300. Need some creative inspiration? I have the solution! CTMH How To Programs for Scrapbooking and Card Making (Wishes, Originals, Reflection, Imagine, and Cherish). Join My Team by Becoming a CTMH Consultant & Receive the NEW Consultant Kit with products from the 2009 CTMH Autumn/Winter Idea Book... only $99. 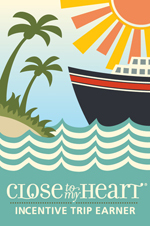 Find out more about Close To My Heart's Thanks-a-bration (August 3-17). You don't want to miss out on a FREE CTMH stamp set and paper pack with your order! Earn the August Stamp of the Month from Close To My Heart for FREE. You'll love the It's Your Day My Acrylix Clear Stamp Set. I'm so thrilled about Studio J by CTMH. The new FREE Online Design Software for Scrapbooking from Close To My Heart is coming Spring 2010. Get ready cause it's awesome! Check out an example here. Here's a pic of Jayma and I, having a blast at CTMH Leadership Conference. Tons of new products... find out more. Ever thought of becoming a Close To My Heart Consultant? Only $99 gets you $300 in products, plus in July you'll receive 5 FREE items... check out it out. Would you like to earn a FREE My Acrylix clear stamp set? Shop now and to get the July Stamp of the Month (You've Got Flair) from Close To My Heart. I received my CTMH $125 Mystery Goodie Box #6 on Friday and just opened it up. Check out the video to see well over $300 in Scrapbooking & Stamping supplies! I'm in awwwww so I wanted to share with you. I received my CTMH Goodie Box #5 today and wanted to share with you all what was inside. Check out my video. CTMH Mystery Goodie Box valued at $300 for ONLY $125 on www.Mandy.MyCTMH.com. It's for TODAY ONLY so hurry and place your order. 6/10 CTMH Deal a Day: Mystery Goodie Box! Visit sundi.ctmh.com to order yours! Check out all the products included in my CTMH Goodie Box from the last Deal a Day offer. TODAYS CTMH Deal a Day is Just Blooms Autumn Daisy for FREE with a stamp set... LOVE IT! Visit sundi.ctmh.com to get yours! Don't miss out on the Incredible Deal a Day Specials by CTMH on Mandy.MyCTMH.com. HUGE deals on scrapbooking and stamping supplies. Want to earn a FREE My Acrylix clear stamp set? Shop now to get the June Stamp of the Month (Tender Tags) from Close To My Heart. Anyone in need of scrapbooking or stamping supplies? I'm trying to hit my Straight To The Top Goal with Close To My Heart.... I'm super close but need your help to get me there! Tickled Pink May Promotion | 3 days left! Only 3 days left to get the FREE Tickled Pink Scrapbooking Kit from Close To My Heart. Visit www.Mandy.MyCTMH.com to order before it's over! Want to earn a FREE adorable My Acrylix clear stamp set? Close To My Heart's May Stamp Of The Month is Be Yourself. SUPER CUTE... you don't want to miss out so order up! Awesome Promotion going on for National Scrapbooking Month. Check out what Close To My Heart is offering! Would you like to receive the new Close To My Heart Summer Idea Book | Catalog for FREE???? Wouldn't you like to get over $300 in scrapbooking and stamping supplies for only $99? If you do... Ask me how? Want to learn more about becoming a Close To My Heart Independent Consultant? I'd LoVe to have you Join My Team. Would you like a FREE Close To My Heart Idea Book | Catalog???? Want to earn a FREE My Acrylix clear stamp set? Close To My Heart's April Stamp Of The Month is Worlds Best Dad. TOO CUTE... don't want to miss out. March Forward with Close To My Heart. I'd love for you to Join My Team! 40% off Retired Close To My Heart My Acrylix Stamp Sets on my CTMH website now. Want to earn a FREE My Acrylix clear stamp set? Close To My Heart's March Stamp Of The Month is Butterfly Wings. ADORABLE... you don't want to miss out.